It is a great story of course; an ancient almost-apocalypse in which an Angry God wipes out most of the planet in some kind of Creation-reboot. When films like this make it onto the mass market however, it is often a good time to take stock and ask what this rehash of Genesis is speaking in to our culture. Movies have to make money. They have certainly parachuted some impressive acting talent into this one, be it a dog or be it screen nirvana. Movies have to plug in to a market demographic, and it seems likely that this epic will sell well in Conservative Christian middle America. The sort of places where many people regard Darwinism as the work of Satan, that the Great Flood explains away the fossil record and the words of the Bible are all we need to understand Science. There is another way to approach the story of the Great Flood however. Some of you will be well aware that there are many other ancient cultures who have a flood myth as part of their received history. There is the Gligamesh one– from at least 1200 BCE, probably a lot earlier. Enki gave Utanapishtim instruction on the boat’s dimensions and construction. It was to measure 10 rods (120 cubits) on a side, six decks dividing it into seven levels, all measured to a height of 10 rods, with nine compartments inside. On the sixth(?) day it was completed. The boat was launched with difficulty, until two-thirds was submerged. Then after everything had been loaded in, including all the craftsmen, the deluge came. Raging storms reached to the heavens, turning all that was light into darkness. As in a battle no man could see his fellow. Even the gods, terror-stricken by the tempest, fled to the heaven of Anu, cowering like dogs. Ishtar cried out like a woman in travail; Belet-ili (Aruru) lamented that the olden time had turned to clay, because she had spoken evil in the assembly of the gods. Six days and seven nights the winds blew. At sunrise on the seventh day they subsided and the storm ceased. Utanapishtim opened a vent and light fell on his face. Water was everywhere. All was silence. All mankind had turned to clay. On the submerged peak of Mt. Nimush the ship ran aground. After another seven days, he sent a dove forth, but it found no perch. He sent out a swallow; it returned too. Then a raven, and this one saw the waters receding. Utanapishtim went forth from the boat; he offered a sacrifice to the four directions; he strewed incense on the peak (ziggurat) and poured a libation — seven goblets and seven — to attract the gods. But Enlil was furious: all mankind was to have been destroyed. Who had revealed the secret? Enki reproved Enlil for causing the Flood, then explained how in a vision given to Utanapishtim the secret had been discovered. His fate must be decided by Enlil, who then declared that Utanapishtim and his wife shall become like gods. The gods took them to the faraway land, to dwell at the Mouth of Rivers — sacred rivers symbolic of the continuous stream of divine wisdom flowing into human life. Over the years, cuneiform flood tablets have continued to turn up. Three distinct Mesopotamian incarnations of the myth have now been identified, one recorded in Sumerian and two in Akkadian. It has become clear that the tale of a universal flood was widespread in Mesopotamia for an entire millennium and a half before the hapless Judaeans, defeated in the early 6th century BC by Nebuchadnezzar, were dragged away from their smoking cities into exile, there to weep beside the rivers of Babylon. 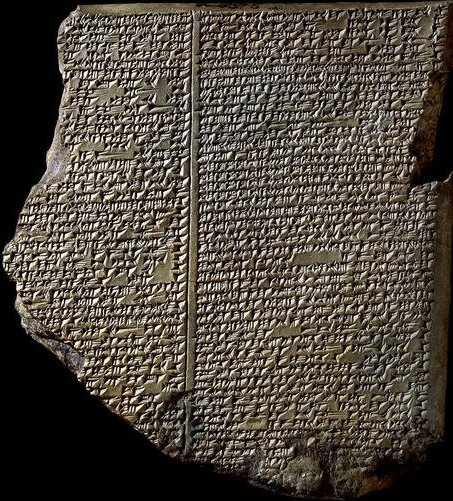 Now, courtesy of Irving Finkel, the British Museum’s eminence grise of cuneiform studies, there comes a further clinching piece of evidence: a tablet that actually describes animals entering an ark “two by two”. Not only that, but it offers startlingly precise specifications on how best to construct one. An ark, so the tablet instructs us, should properly be circular in shape, have an area of 3,600 metres, and be fashioned out of plant fibre. All those living in the Somerset Levels may wish to take note. By plundering the heritage of Babylon, they were at once paying homage to its cultural prestige, and annexing it to their own ends. Just as Christians and Muslims would subsequently transform the biblical figure of Noah into a prefiguring of their own respective theodicies, so the Judaeans transformed the myths of their Babylonian overlords into something that would end up as Jewish. In Mesopotamia, where it was the custom to erect buildings over the remains of levelled ruins, the ancient past literally provided the foundations of new temples. In a similar manner, its legends were made to serve the self-mythologisation of the Jews. Some details of the flood tablet discovered by Finkel – the animals going in two by two, for instance – were cannibalised; others – the specifications of the ark’s measurements, and the detail that the great ship had been round – were not. This, for me, is the real fascination of his find: the light it sheds on how a despised and defeated people won a victory over their conquerors so remarkable that it now gets to be commemorated by Russell Crowe. We make of these stories what we need them to make. The ‘truth’ of them requires us to look a little deeper, a little further into ourselves. Perhaps as far back as the melting of the last ice age, and the rising sea levels that swallowed whole villages, whole hunting grounds in a relatively short time scale- certainly within the span of people’s lifetimes, and within generational historical memory. This entry was posted in Uncategorized and tagged Epic of Gilgamesh, flood myths, irving finkel, Noah, noah film by Chris Goan. Bookmark the permalink.